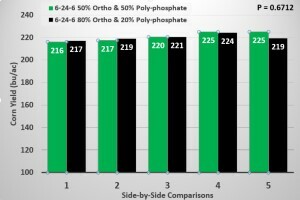 Ortho-phosphates are 100% plant available, but a high percentage of poly-phosphates in starter fertilizers convert to ortho-phosphate within just two days of application. This quick conversion from poly- to ortho-phosphate suggests expensive “high” ortho starter fertilizers are not likely to result in increased corn yields compared to seed-safe fluid starters containing a higher percentage of poly-phosphate. 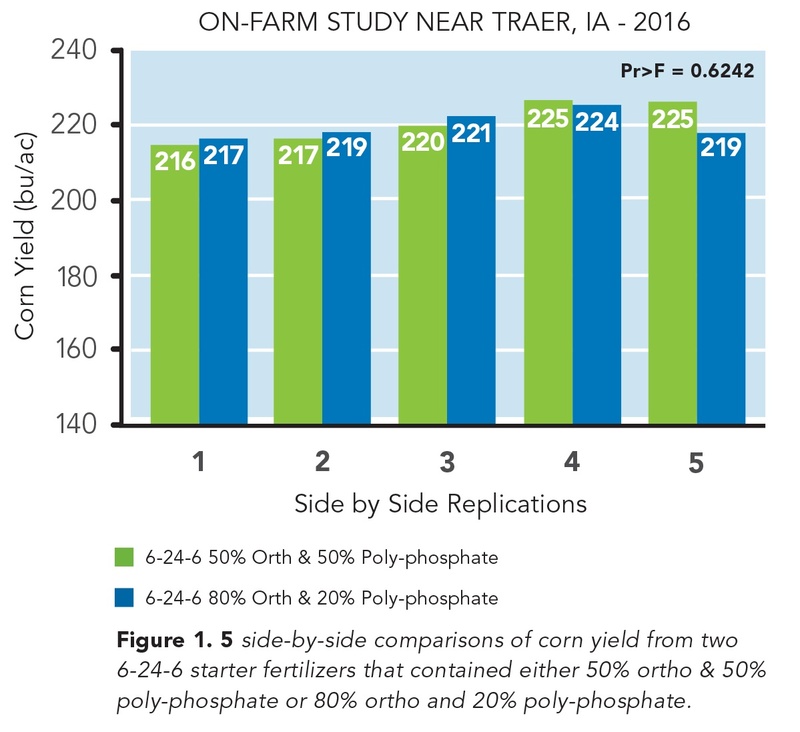 On-farm field studies conducted near Traer, IA in the 2016 and 2017 growing season found no statistical difference (Pr > 0.05) in corn yield between conventional and high ortho-phosphate starters in either year. High ortho starters cost more per acer than 50/50 ortho:poly starters, but do not increase corn grain yields. Given polyphosphates are not immediately plant available and orthophosphates are immediately plant available, this gives the promoters of “high” orthophosphate starters ample opportunity to muddy the waters. Nevertheless, the facts are, polyphosphates are rather rapidly hydrolyzed (converted to) into orthophosphates once applied to soils, and this hydrolysis process generally takes just 48 hours or so to complete. In September of 2015, we posted a blog discussing some of the more technical reasons why the ratio of ortho to polyphosphates in starter fertilizers should have no impact on corn yields. For those that are interested in the more technical details, we encourage you to follow this link to the September 2015 blog post. While we was relatively certain that the ratio of ortho to polyphosphates in liquid starters should have no effect on corn yields, we decided to “test” this idea with on-farm field trials located near Traer, IA in the 2016 and 2017 growing seasons. 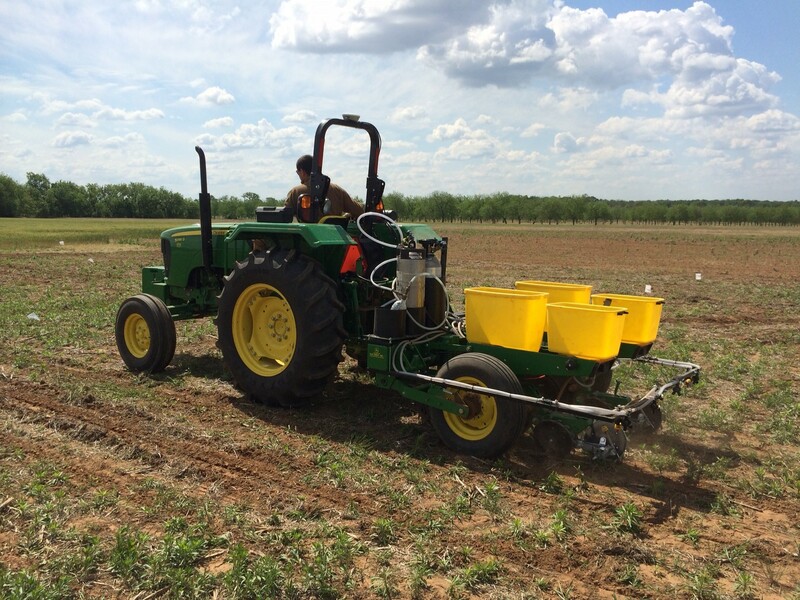 In these field trials, we used two starters applied in-furrow at 6 gal/ac. Each starter had an NPK nutrient analysis of 6-24-6. The only difference between these two starters was the ratio of ortho to polyphosphates. One of these starters contained 80% orthophosphate and the other contained just 50% orthophosphate. With the remainder of the phosphorus source in each of these two starters being polyphosphate. Each plot was planted with a 24-row planter (Picture 1) and was nearly 2400 ft long. In both the 2016 and 2017 growing seasons the experimental design used was a randomized complete block with 4 or 5 replications. Averaged over the side-by-side replications there was less than 1 bu/ac difference in corn grain yield between the high ortho and low ortho polyphosphate starters in both the 2016 and 2017 growing seasons. In addition to finding no differences in grain yield between these two starters, the high ortho starters generally cost about $1 more per/gal (so the $6/ac difference in price at a 6 gal/ac rate) than the low ortho starters. So the more expensive high ortho starter clearly did not “pay” its way in our multi-year field trials. While our findings agree with other research-comparing ortho and polyphosphate starter fertilizers (Frazen and Gerwing. 1997), we want to be absolutely certain that our fertilizer offerings are the most economically viable products on the market. Therefore, we have decided to run this same field trial at one location in northern, IL in 2018, and at one location in central, IA in 2018. Stay tuned for those research results next fall. Franzen D. and J. Gerwing. 2007. Effectiveness of using low rates of plant nutrients. North Central regional research publication No. 341. http://www.extension.umn.edu/agriculture/nutrient-management/fertilizer-management/docs/Feb-97-1.pdf (accessed 8 of Sept 2015). A big Thank You to Dr. Vossenkemper for sharing this article with us. 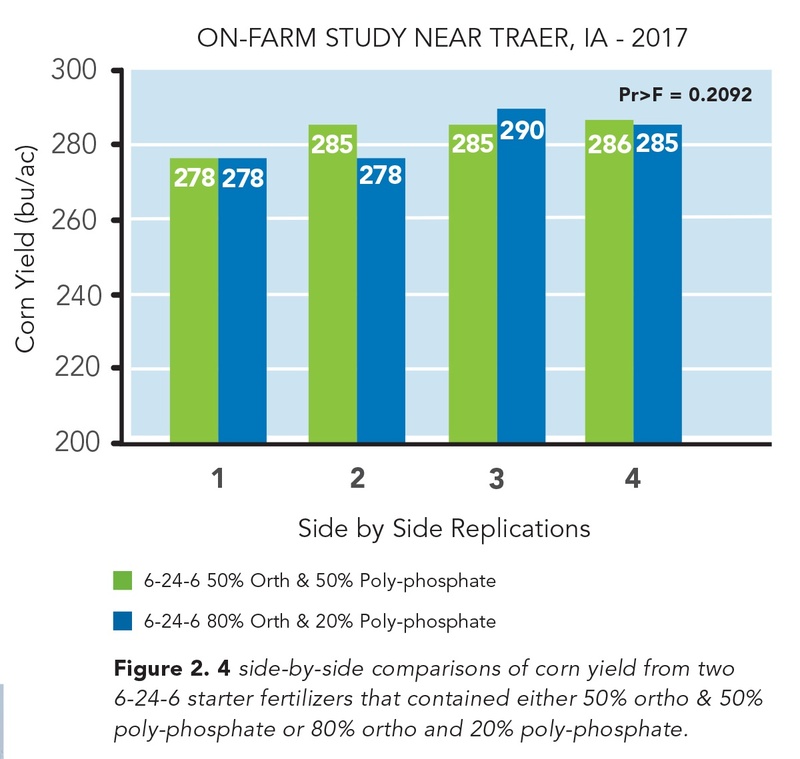 A field study conducted near Traer, IA in the 2016 growing season found less than 1 bu/ac yield difference between a 50/50 ortho:poly starter and high ortho-phosphate starter. Given poly-phosphates are not immediately plant available and ortho-phosphates are immediately plant available, this gives the promoters of “high” ortho-phosphate starters ample opportunity to muddy the waters. Nevertheless, the facts are that poly-phosphates are rather rapidly hydrolyzed (converted to) into ortho-phosphates once applied to soils, and this hydrolysis process generally takes just 48 hours or so to complete. In Sept. of 2015, I posted a blog discussing some of the more technical reasons why the ratio of ortho- to poly-phosphates in starter fertilizers should have no impact on corn yields. For those that are interested in those more technical details, I encourage you to follow this link to the Sept. 2015 blog post: https://www.liqui-grow.com/farm-journal/. While I was relatively certain that the ratio of ortho- to poly-phosphates in liquid starters should have no effect on corn yields, I decide to “test” this idea with a field trial in the 2016 growing season conducted near Traer, IA. In this field trial, we used two starter products applied in-furrow at 6 gal/ac. Each starter had an NPK nutrient analysis of 6-24-6. The only difference between these two starters was the ratio of ortho- to poly-phosphate. One of these starters contained 80% ortho-phosphate and the other contained just 50% ortho-phosphate with the remainder of the phosphorous source in each of these two starters being poly-phosphate. Each plot was planted with a 24-row planter (Picture 1) and plot lengths were nearly 2400 ft. long. In total, there were 5 side-by-side comparisons of the two starter fertilizers that contained different ratios of ortho- to poly-phosphates. 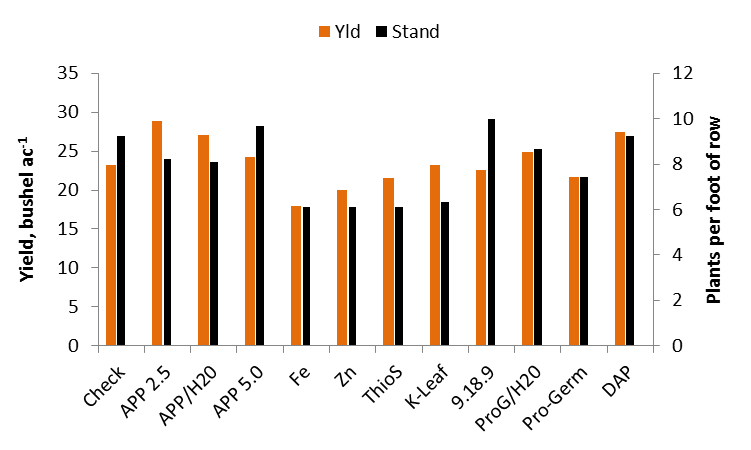 In general, there were no large differences in yield between the two starters in any of the 5 side-by-side comparisons, except for comparison number 5 (Figure 1). In comparison number 5, the 50% ortho/50% poly-phosphate starter actually yielded 6 bu/ac more than the high ortho starter. But averaged over the 5 side-by-side comparisons, there was less than 1 bu/ac yield difference between the high and low ortho starters (P=0.6712). In addition to finding no differences in grain yield between these two starters, the high ortho starters generally cost about $1 more per gallon (so $6/ac at a 6 gal/ac rate) than the low ortho starters. So the more expensive high ortho starter clearly did not “pay” its way in our 2016 field trial. While our findings agree with other research-comparing ortho- and poly-phosphate starter fertilizers (Frazen and Gerwing. 1997), we want to be absolutely certain that our fertilizer offerings are the most economically viable products on the market. Therefore, I have decided to run this same field trial at one location in northern Illinois in 2017, and at one location in central Iowa in 2017. Stay tuned for those research results this fall. 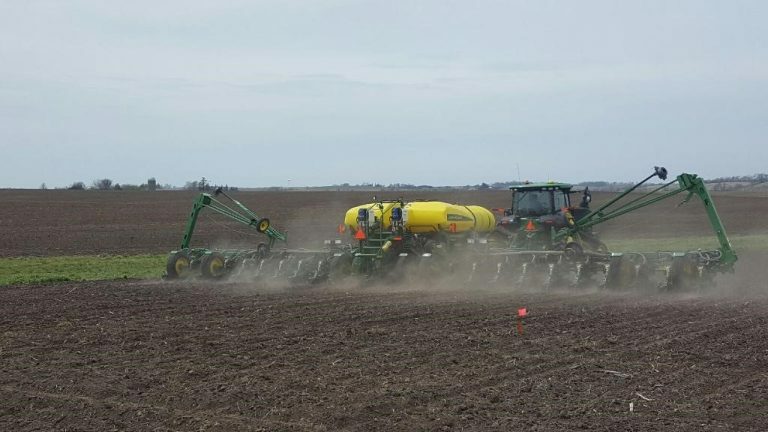 Planting starter fertilizer trials near Traer, IA in the growing season of 2016. 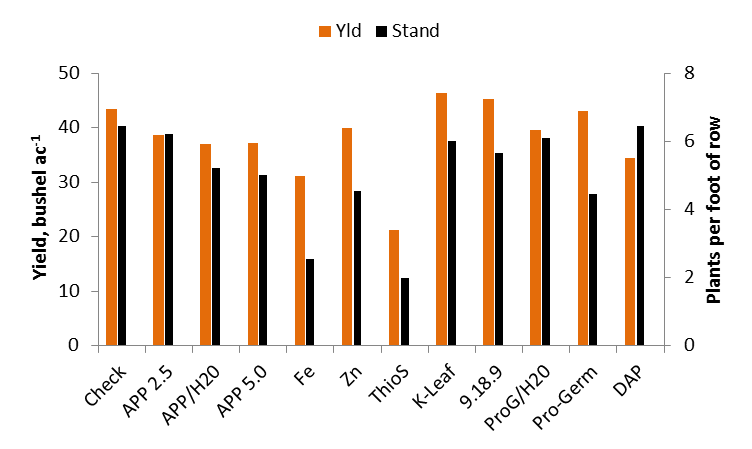 5 side-by-side comparisons of corn yield from two 6-24-6 starter fertilizers that contained either 50% ortho & 50% poly-phosphate or 80% ortho and 20% poly-phosphate. The field trial was conducted near Traer, IA in the growing season of 2016. The Sufficiency versus Replacement tipping point. January 17, 2017 10:12 am / 2 Comments on The Sufficiency versus Replacement tipping point. Being educated in the realm of Soil Fertility at Oklahoma State University by the likes of Dr Gordon Johnson and Dr. Bill Raun, Brays Nutrient Mobility Concept and Mitscherlich’s Percent Sufficiency Concept are ingrained in my psyche. In class the concept of Build and Maintain for phosphorus fertilizer management was just briefly visited and not discussed as a viable option. For anyone in the corn belt, and some Okies, reading this that may seem unusual. But when I was in school on average in Oklahoma there was about 100-200 K acres of 100 120 bpa (bushel per acre) corn, 300-400 K acres of 40-50 bpa sorghum, and over 5 million acres of 20-30 bpa wheat. In a state with those average yields, replacing P removed by the crop was not a major concern. But times are changing. There is more corn and soybean planted and the achievable yields of all crop are increasing. While the average winter wheat producer should not be worried about replacement rates of P there is a growing group of producers that should. This blog will discuss the scenarios in which sufficiency rates are best and those in which replacement should be considered. The OSU factsheet PSS-2266 goes in-depth on each of these methods. 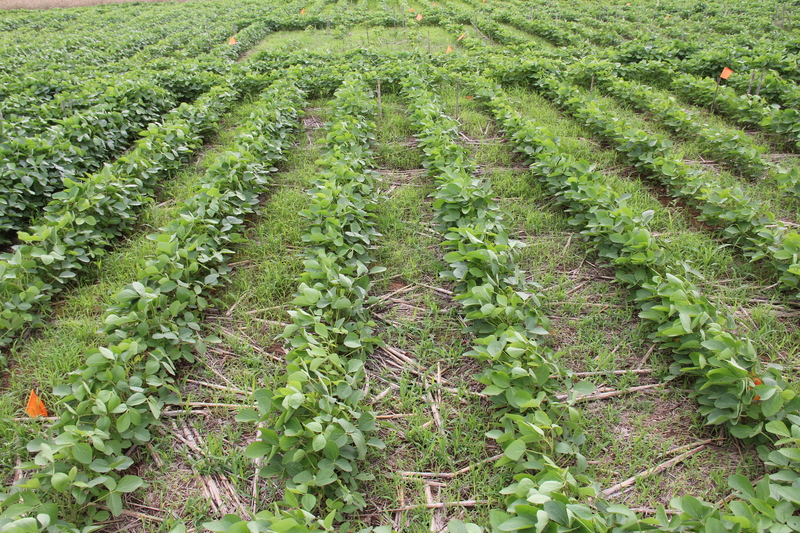 Applying P based on sufficiency will increase soil test P levels in a low yielding environment. For example on a 20 bpa wheat field that starts out with a soil test P level of 0. Using the sufficiency recommendation each year the soil test value will reach 20 ppm (40 STP) in 20 years. A 30 bpa field would take 30 years. Yes that is a long time but the soil test value is increasing a little each year. The point of 20 ppm is important because at that level the crop is 95% sufficient, meaning if no P is added the crop will only reach 95% of the fields yield potential. Using a mass balance approach we can determine at what point does the crop remove more than we can supply with in or near furrow starter fertilizer. Table 1 shows the values I am using for the discussion. The first column is just the average amount of P removed per bushel of grain, most of our grains fall in the .4 to .5 lbs P per bushel range. The second column is the soil test value at which P level is said to be at 90% sufficient. The reason this column is included is that the P2O5 reccomendation for this P level fits into the starter rate for all crops. 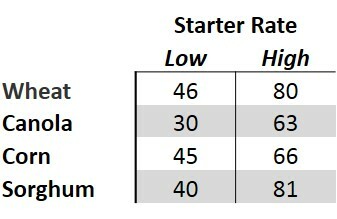 The low high starter rates are the typical range of P2O5 that is delivered within the safe range (N based) and what I see as the common rates. These values may be above or below what you use. Table 1. Values used to create Table 2. Phosphorus per bushel of grain. Mehlich 3 soil test value (ppm) at which crop is determined to be 90% sufficient, typical range of P2O5 applied with starter fertilizers, recommended P2O5 rate when soil test P is at 90% sufficiency. Table 2 is pretty simple but it is the center point of this article. The one caveat I need to add is this assumes strip till or 2*2 / 3*2 is not being used. Table 2 is using the starter range and removal value to determine the yield level the starter can support. The first take on this table may provide some hint on why in a state with 5 million acres of wheat averaging 36 BPA the state soil fertility specialist didn’t focus on replacement rates. In fact for most for most the the wheat ground P application is higher than removal and P levels are slowly increasing. The big take home from this table should be is my yield level outside this window? If so do not immediately go out in crease your P rates but do take a close look at your system as a whole. Take a close look at your cropping system, not just one seasons but look at a three or four year cycle. Add up P applied and P removed, are you positive or negative net balance? If you are negative take a long hard look at your soil test over time. Some soils can supply a large amount of P even if you are removing more than you apply. Other soils will be rapidly drawn down. 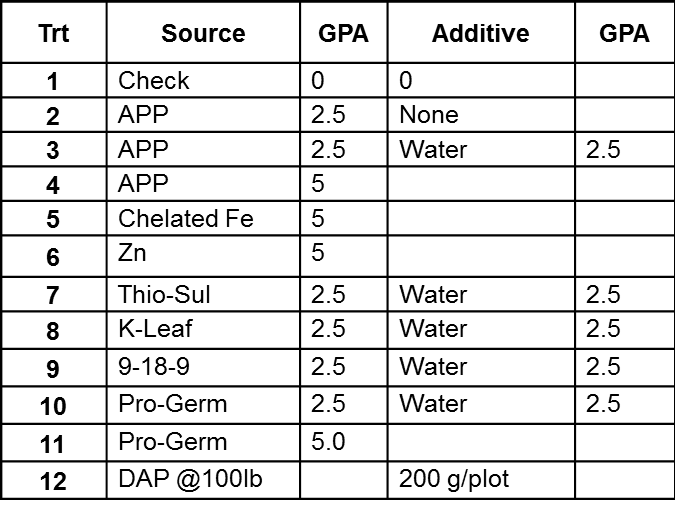 Regualr soil testing allows for producers to keep an eye on these values. Table 2. Yield level (bushels per acre) at which P removal is equal to P added in starter fertilizer application. In the end even if the production warrants the use of replacement rates, the current market may not. For more on that read https://osunpk.com/2016/08/27/now-may-not-be-the-time-for-replacement/. Speaking of market currently both soybeans and cotton are getting a lot of attention due to how the economics is penciling out. 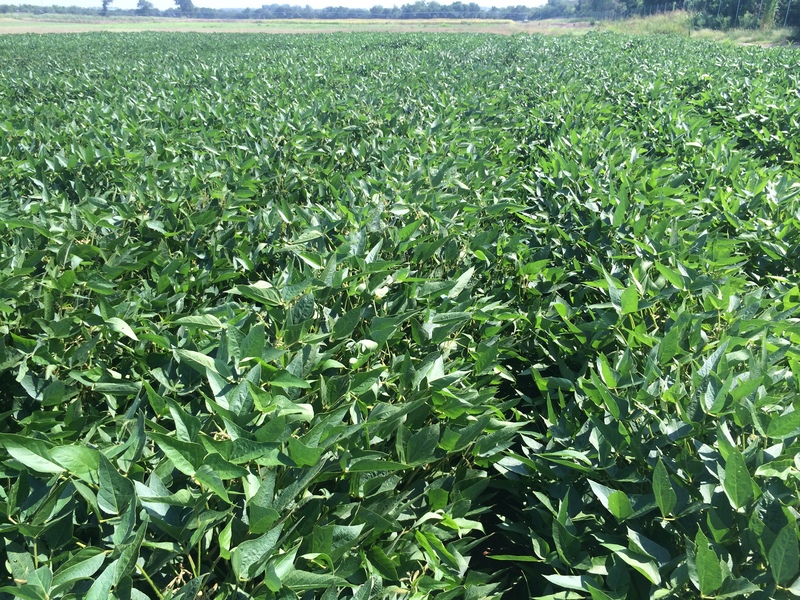 Soybean is a “heavy” P crop pulls .8 lbs per bpa while cotton removes 13 lbs per bales. Both of these crops are salt sensitive and the rate of inforrow is typically quite low providing only about 6 lbs when on 30″ rows. If you are growing beans or cotton make sure you account for their removal when you talley up your system. Below is a table that I wanted to add, well because I like it. 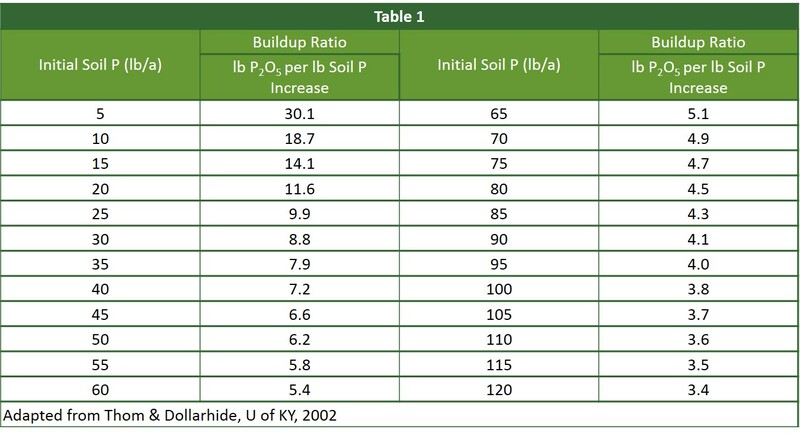 This table illustrates that buildup, and drawdown, rate is heavily impacted by existing soil test value. 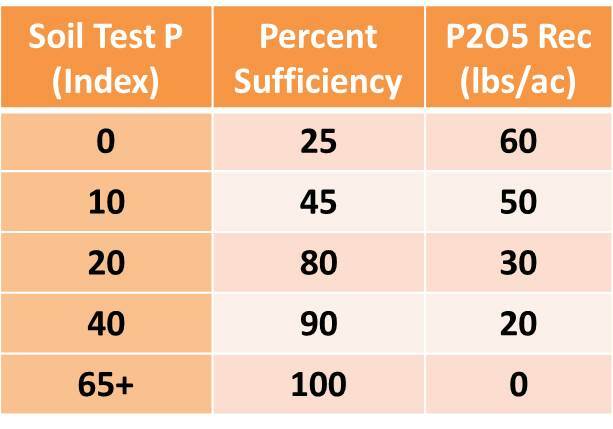 In short it takes a lot more fertilizer P to raise soil test p levels in a very low P testing field than it does when soil test P is closer to optimum, 19 lbs per 1 lb at STP of 10 and 5 lbs per lb when STP is 65. The exact rate changes by soil type and the same holds true to drawn down via crop removal. Amount of P2O5 above crop removal needed to increase soil test phosphorous based upon initial soil test results. Canola fertilizer rates when skip row seeding. When drilling canola a common strategy to improve seeding rate accuracy is to only use every other row which effectively doubles the rate of seed going through each meter. There are also many producers who utilize air seeders and just prefer the wider spacing. Every season I get several questions about determining total fertilizer rates if the seed is dropped every other row but fertilizer is dropped every row. Regardless of whether or not fertilizer goes down every row it is important that the amount of salts placed with seed does not exceed the limit. 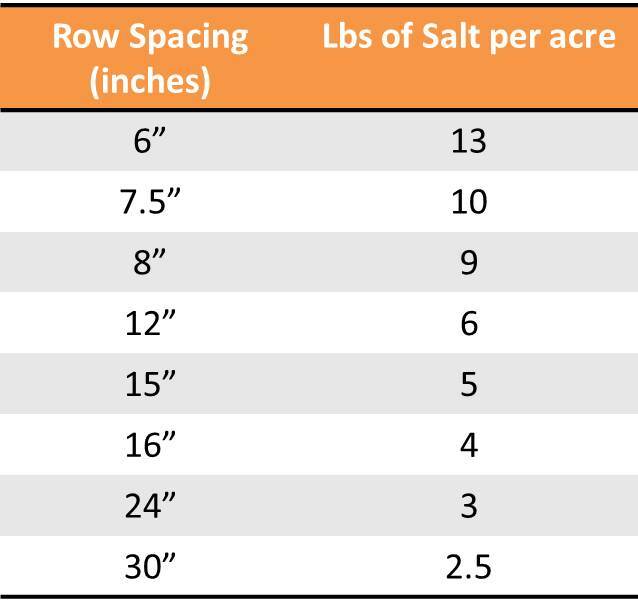 The table below provide the limits in terms of lbs of salt per acre. If using 18-46-0 (DAP) or 11-52-0 (MAP) this is equivalent to pounds of N per acre. However if the fertilizer you use contains potassium (K) or sulfur (S), those have to be considered. An easy rule of thumb for determining total salt level of a fertilizer is pounds of N + K + 1/2 S.
Maximum amount of salt that can be applied in furrow with canola seed. Application rate should be at or below this value. In a scenario in which canola is seeded in skip rows but every row will get fertilizer the total amount of fertilizer can be doubled. For example on a 15″ row spacing the max salt rate is 5 lbs per acre. If you were using DAP as your starter that maximum rate to place in furrow would be 28 lbs of DAP per acre. If using a drill set of 7.5″ spacing and putting fertilizer down every row the max rate would increase up to 56 lbs DAP per acre. Seed, colored blue, is placed in every other row while an equal amount of fertilizer, dark grey circles, is placed in every row. Some producers may have the capability of applying different rate in every other row. In this scenario it is important to maintain that safe rate in the seed furrow. In the opposite row, fertilizer rate can go as high as you wish or the equipment can handle. Seed, colored blue, is placed in every other row while fertilizer, dark grey circles, is placed in every row. In this scenario a high rate is placed in the row without seed. Now the big question is, “Is between row fertilization a good idea?” While we do not have results on this style of application (trials will be going out this year) we can draw upon upon similar work in other crops. For me the best win would be the second scenario in which a higher rate could be place between the rows. In this row I would use a urea and DAP blend. Any time we can put urea below the soil surface its a win and in fields with very soil soil test phosphorus (P) it would create something similar to the deep P bands once popular in corn production. Now if the field had adequate soil test P, I would focus on urea between rows. Keep in mind it is never a good to place urea in furrow with canola seed. For the average producer who is using a box drill the first scenario is the only option. In this case the rate of the between row bands will be reduced however I still believe on fields with very low soil test P this is potentially a great way to get the rest of it on. Remember if on 15″ and using DAP max rate only gets 12.9 lbs of P2O5 down. If fertilizer is dropped down every tube that number increases to about 26 lbs P2O5, which is still not enough for fields with low soil test P, but is better. With hope we will have some good results to share from the 2015-2016 canola crop.